An unusual cult group which specializes in eating roasted human flesh in Kuso Village in Lavun Local Government Area, Minna in Niger state has been apprehended by the Niger state police force according to the website, Crime & Security. The cult group which comprises of an aged grandmother, Fatima and her accomplices Tetengi (male) and one Aminatu, were arrested for murdering a nine year old boy, Umar, roasting the body and eating it. Prior to the victim’s murder, his father, Mohammed (surname withheld) had placed him in care of his mother, Fatima, pending his arrival from a short journey within the state – however, things turned out unexpected. 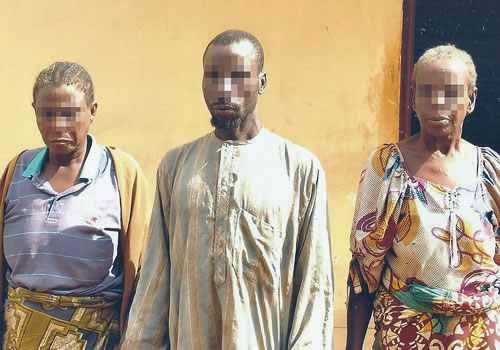 A police source at the Homicide unit of the Criminal Investigation Department, Niger State Police Command headquarters, Minna, disclosed that Fatima, who happens to be the first suspect, gave the boy to the second suspect, Tetengi with an understanding to slaughter the boy and share his body among the three of them which included Aminatu. Investigations by the police revealed the victim was slaughtered by Tetengi, who roasted the boy and shared his body with Fatima and Aminatu as planned. Upon his return from his trip with no trace of his son, the victim’s father reported the case at the Bida Divisional Police Headquarters, to unravel the mystery behind the disappearance of the nine-year-old boy. The Police commenced preliminary investigation into the matter after which the arrests of the three suspects were made and the case was transferred to the Criminal Investigation Department of the state police command. The suspects confessed to the crime during interrogation by the homicide detectives adding that human flesh was tastier than those of animals.